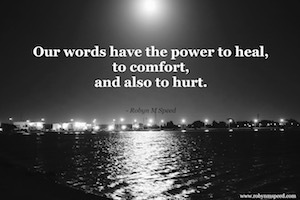 Our words have the power to heal, to comfort, and also to hurt. Every word that we utter comes with two sounds, which are in effect frequencies, so we have the frequency of the sound of the words themselves, and we have the sound of the frequency of emotion, or energy, that is experienced as those words are said. A word can come as a soft utterance filled with love. A word can be fired like a dart, with the intent to hurt. Sometimes we may be going through a tough time, and we say things we know we don’t mean, but we are in pain. If we are lucky, the person we upset will know that it is the pain speaking not the heart. However, for many people this understanding, and ability to sense, is lacking, and they simply take it as an assault, and they fight back. This begins a battle of words and deliberately inflicted pain. So, let’s take a pause, and for one day, try to be aware of every word we speak, and to speak with kindness—genuine kindness. You may find that at the end of this day you feel wonderful, or you may have found it a real challenge. The words that we speak, they express who we are to the world. The truth behind words speaks through those words, so we may be saying one thing and thinking another, in which case the energy comes through as confusing, but the truth sounds through much greater than false words. To a person who is sensitive to energies, you can never speak falsely, to them for they will know. Our words, carefully chosen, spoken from the heart, spoken with loving kindness, these words can heal, comfort and sooth. And when those words are spoken from our place of authenticity, then we have truly expressed the grace of our Soul. However, so often, hurt people hurt people. It is the hurt that talks. Until we heal, we risk our hurt doing all the speaking for us, keeping us trapped in the victim mentality—whilst desperately wanting to no longer feel like a victim and to be at peace. That journey of healing is a deeply personal one, and it can often be very difficult, but, so is biking up a steep hill, so is running a marathon, so is giving birth, but it is worth it, for all these things, it is worth it! Keep progressing, no matter how many times you fall, keep getting back up and trying … and please, take the time to observe yourself and think about the person you are today, the person you were a year ago, the person you were three years ago, and you may find that you are more at peace with who you are today than you were three years ago. Sometimes we need to take the time of self analysis to truly realise how far we have come. The words that we speak, on a good day, or a bad day, they show us who we are. They also show us where we need to look and do more work. If I am upset with something I may take the time to sit with what it is within me that is upset, for that is all my journey and no one else’s. And then I will respond with careful choice of words, with kind choice of words. I may gently express my truth, but I will not be cruel, because that is not an expression that is true to who I am. How I respond to life, the energy I feel, the words I choose, these are all an expression of me. I can touch life and make it beautiful. I can speak words of kindness, feeling the kindness in my heart and soul, and every utterances touches life, and has an effect on all that is around me. The world responds to me. And your world responds to you. So, I am going to repeat myself, because I really want you to understand this and to remember it: Every word that we utter comes with two sounds, which are in effect frequencies, so we have the frequency of the sound of the words themselves, and we have the sound of the frequency of emotion, of energy, that is experienced as those words are said. Just because we do not audibly hear emotion does not mean the frequency of it is not sung loudly! It is that which is truly felt and heard. For one day, try to choose words of kindness, and see how you feel at the end of the day. Do not make excuses for harsh words, do not try to justify harsh words … simply choose to have a day where you speak words of kindness, from a place of kindness within you. If we want peace and kindness in the world, then we have to be the ones to create it.